Mark James (AKA The 45 King) is a world renowned DJ/Producer pioneer in Hip Hop music. His breakbeat classic ''The 900 Number'' has been a staple among DJs since its release in 1987 (notably featured as the song to ''The Ed Lover Dance'' on MTV's Yo MTV Raps). Throughout the last 30 years, 45 King has managed to stay relevant, producing hits for some of Hip Hop's biggest names including Jay-Z & Eminem, with production for their hit songs ''It's A Hard Knock Life'' & ''Stan'', respectively. With a prolific output and catalog of beats, he has set out to release a series of limited edition 45s with brand new and never before heard music. M.A.S.H. 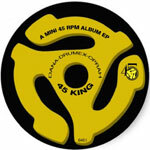 is a unique, ''mini 45 RPM album'' featuring 45 King's signature sound; breaks chopped and looped to perfection.